The Vietnamese Hut, Eight Mile Plains, Brisbane - my name is Food. Trying to get our Vietnamese fix after weeks of not having our usual, we decided to try The Vietnamese Hut located at Runcorn Plaza, opposite Warrigal Square. It was quite a quiet night so it was just a nice and peaceful dinner for us. As we sat down, we were given hot Jasmine Tea which was great as some restaurants now are charging for tea and opting it now with just tap water. 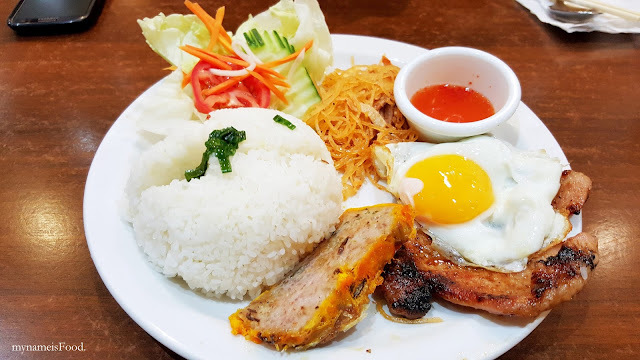 'Special Combination Steamed Rice' ($10) came into my mind as I didn't feel like ordering Pho nor Bun Thit however what got me confused was that it said Steamed Rice instead of the usual Broken Rice so I was not too sure of what I would get. When the dish finally arrived on our table, it was definitely broken rice but it didn't have that distinct smell nor was it made nicely as it was quite dry. 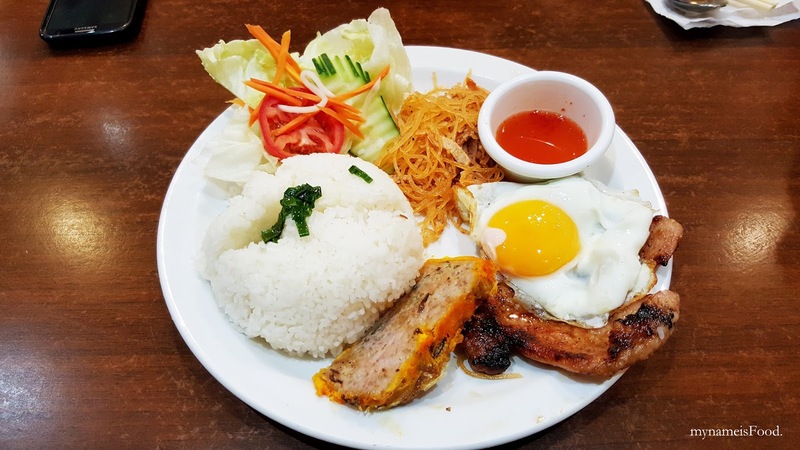 Since it was a dry dish, it had Grilled Pork Chop, thinly shredded pork mix with cooked and shredded pork skin, prawn paste cake (which may also be pork meatloaf) and fried egg. A dipping sauce is also given which is usually some sort of fermented fish sauce. However, this seemed more like a sweet chilli and vinegar mixture giving it more that acidic flavour and tangyness. Overall, it was a pleasant dish to have with each of the elements being cooked nicely. The fried egg was not too dry but was just right. 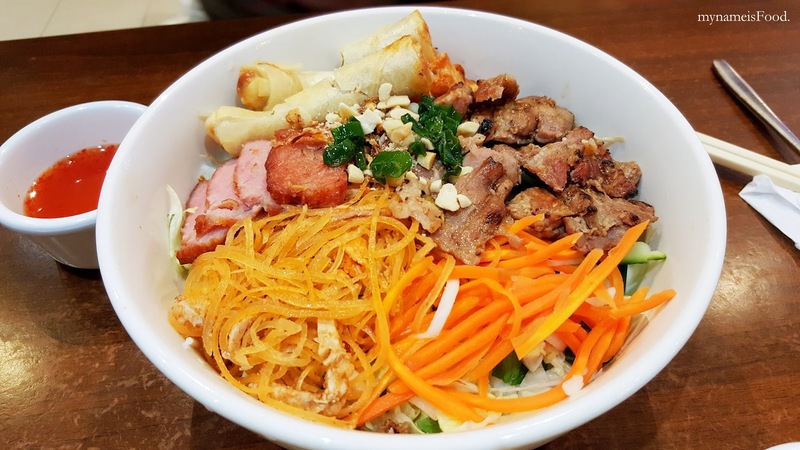 'Special Combination Rice Vermicelli' ($12) is always a must-have for the Mr. and this although was smaller than the usual portion, it didn't really matter as much as it was quite filling in the end anyway. The dressing however was just okay, it maybe needed a little bit more tangyness and kick. 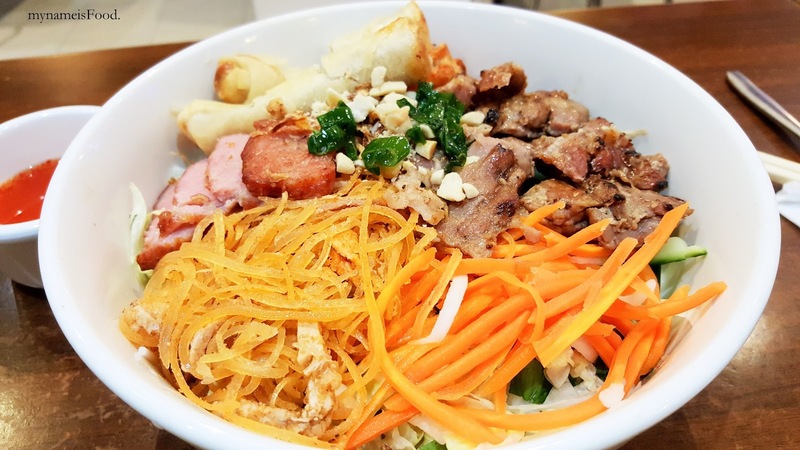 As for the toppings, some were less than other Vietnamese restaurants such as the spring rolls or the fishcake or such. However, the grilled pork was more choppy here than big chunks or slices.